4J Studios is hard at work on Title Update 9 for the Xbox 360 version of Minecraft. To prove to fans that they're making progress, the studio released a lone screenshot of the patch's new content. 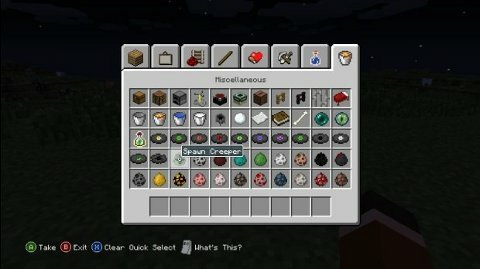 The screenshot shows an inventory full of Spawn Eggs. Spawn Eggs are items that allow you to directly create mobs. You can create peaceful animals to inhabit the world or spawn a monster if you feel like fighting something. Title Update 9's big new feature is called The End. The End is a bleak dimension inhabited by Endermen and a black drake known as the Ender Dragon. Defeating this Ender Dragon will be a difficult task but it earns players a decorative egg. It also gives players a sort of "final goal" for the otherwise unstructured game. 4J is also working to bring all of the features from Minecraft's PC version to the Xbox 360. Upcoming features for Minecraft Xbox 360 Edition include Ocelots and jungle terrain. The studio confirmed via Twitter that those two particular features won't make it into Title Update 9, though. Title Update 9 will arrive in March at the earliest, according to 4J.